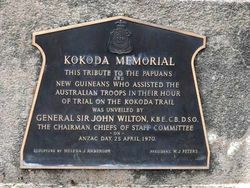 This memorial was dedicated as a tribute to the Papuans who assisted the Australian troops on the Kokoda Track from June 1942 to October 1945. The Papuans worked as stretcher-bearers, porters and general labourers for the Australian Army, and were regarded with great respect and admiration. In 1983 the Kingston Narrabundah RSL Sub-branch donated the sculpture to the Canberra Services Club. Forty-six Papuans were killed in combat supporting the Australians, and a further 162 died from illness or as a result of accidents. 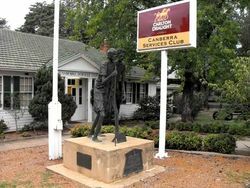 The bronze memorial is loosely based on a famous photograph of Raphael Oimbari leading a blind- folded Australian, taken in Papua during World War Two. ANZAC Day, 25th April 1970. STATUE DEPICTS "FUZZY WUZZY ANGEL"